What does a “75% Chance of Rain” mean? Someone wanting to know the backstory for how the daily statistical techniques we use to make decisions were developed. This should be on the bookshelf of any statistician. It can also be considered a generally interesting book for a lover of history. I read this book over the course of several months. It’s essentially a history and philosophy book delivered through a set of stories. I would usually read a few chapters, set it down for a month, then pick it up again. For me it was leisurely sort of read. 340 pages. There were about 70 sections that I noted or highlighted- about two or three ideas per chapter. Mostly I found something interesting about how techniques were generated, and occasionally my interest was piqued about a philosophical area of statistics. David Salsburg does a fine job of taking what could be dry technical details about the origin of statistical techniques, and wrapping them around the stories of the people who developed them. Salsburg moves chronologically through the scientists’ lives to display how concepts grew over time. Learn Your Roots. Salsburg wants us to see that breakthroughs happen because of individuals and their personal relationships. I think he wrote this to give recognition to these influential people. The Lady Tasting Tea, looks through a collection of famous statistical theories, from the eyes of the people who developed them. As someone who uses statistical methodology daily, it was helpful to understand the thought processes behind the methodology. It helped me sharpen my thinking about the application of these techniques by understanding the problems their were originally designed to solve. 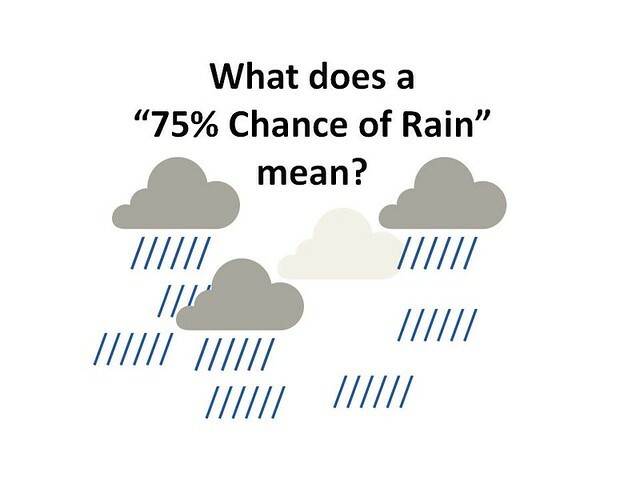 An “X” probability of rain is not clear about what the probability represents. Does it mean that it will rain for 25% of that day? Does it mean that 25% of Atlanta will be rained on? When presenting probabilities specifics are not necessarily helpful. Most people do not distinguish between 75% or 90%. The probability only needs to be sufficient for making a decision. Anything more specific than that fails to register. Statisticians are typically consulted once a client has decided that they are ready to conduct analysis, only to find out that they can’t generate any helpful results because basic test set-up was never done. Cunliffe’s thought resonated with me since I’ve been asked to conduct analysis and “produce” a number. I knew full well that the analysis would be an abuse of statistical assumptions. It can be hard in a businesses “just-it-get-done” enviroment to serve the organization with statistical analysis while abiding by all the correct test guidelines. Cunliffe’s statement alerts me to find ways to redirect a clients’ desire in wanting to conduct illegitimate analysis. 1.) Do you realize how people are going to apply the probabilities you provide them? Don’t invest too much time into developing a level of detail that isn’t going to materially alter their decision. Understand that we all interpret an abstract concept like probability very differently, even with available definitions that everyone “should” follow. 2.) Do you produce results just for the sake of churning out numbers? There is value in discouraging a client from carrying on analysis that will generate erroneous findings. The point of most statistical application is to help us make more effective decisions. Perhaps show the client how carrying out the unplanned analysis will not just have a neutral, but a negative impact on their decision. It is the combination of both the certainty of rain falling somewhere in a given area and the percent of that space that will receive rain if the rain falls. It can be confusing because it is the multiplication of two probabilities which are assumed to be understood by people, but probably are not.